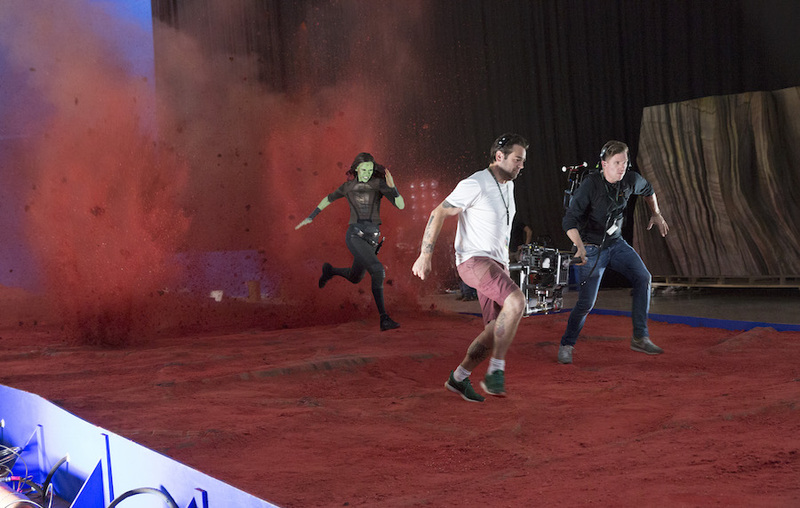 While on the Guardians of the Galaxy 2 set last year, I had the chance to sit down and interview producer, Jonathan Schwartz. We were sitting in a room filled with art that inspired the upcoming movie and I couldn’t help but run around and put all the imagery to memory. What a great day! If you are looking for some secrets from the set, I have great news. 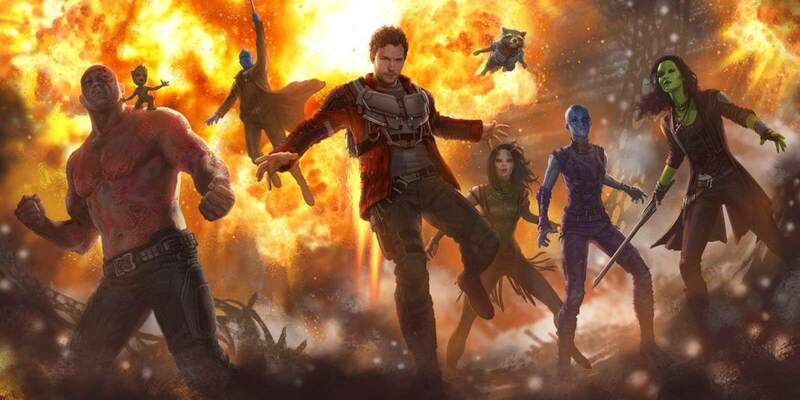 Where does Guardians of the Galaxy 2 pick up? When we first meet them at the beginning of the movie, it’s a couple of months after the events of Guardian 1. So, they’ve sort of been taking mercenary work around the galaxy trying to pay their bills. Trying to do better and do good as much as they can. So, when first see them, they’re on a mission trying to protect a planet from this horrible, tentacled beast, which we’ll see a lot of. They’re trying to prevent this beast from stealing something from this planet led by Ayesha – a new character who we’re introducing in this movie. Along the course of that mission, some of the Guardians refer to their old bad habits. And so, the [Sovereign] end up coming after their heroes and create another chase action sequence in which our heroes bicker and argue. How have the characters grown since the last film? If at all. 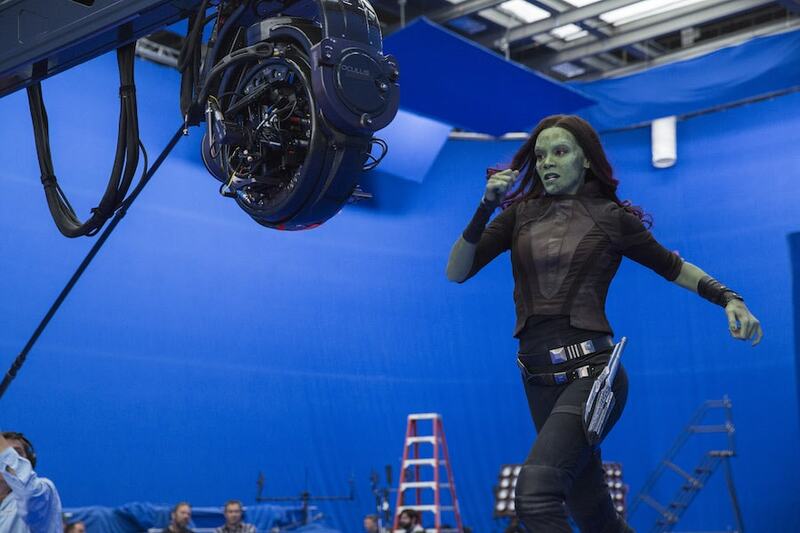 When we first meet the Guardians, you will notice some of their costume changes. 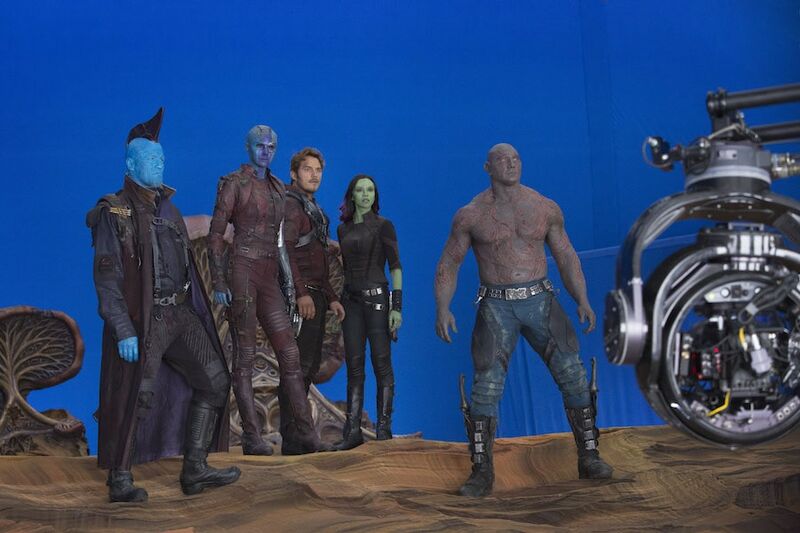 They’ve evolved a little bit from the way they looked in Guardians 1. More like rock and roll – a Rolling Stones direction. The Guardians are a little full of themselves now. They’re a little famous. They saved the entire planet from Zandar and they’re like, oh, yeah, we’re famous all over the galaxy. We can do whatever we want. As you can imagine, the fame is kind of going to their heads a little bit and making it difficult to live with each other. 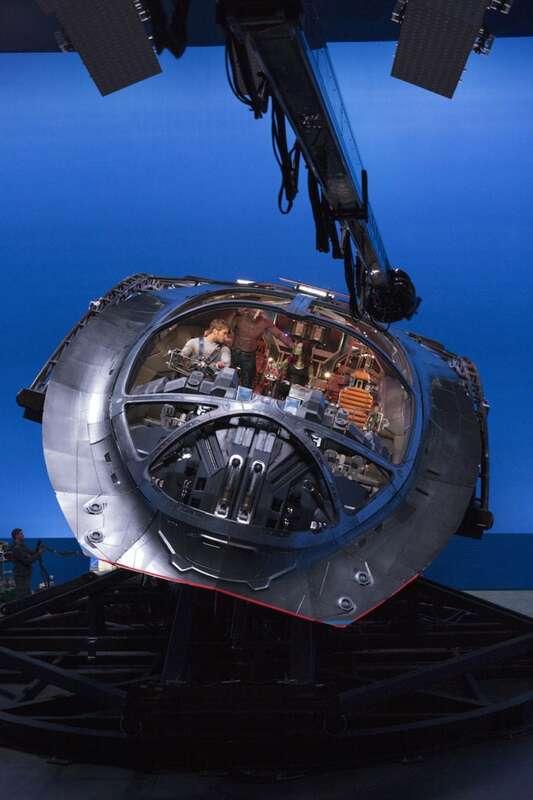 Peter Quill’s ship, which we see them fly off on at the end of Guardians 1, is a ship that’s kinda built for one person not really a person and their team and a tree and a raccoon and a giant Drax. The space that they’re in has kind of confined them. Like a family that’s in a house that’s too small, it is creating tensions in the group. What about Yondu and Peter? Will that relationship mend? 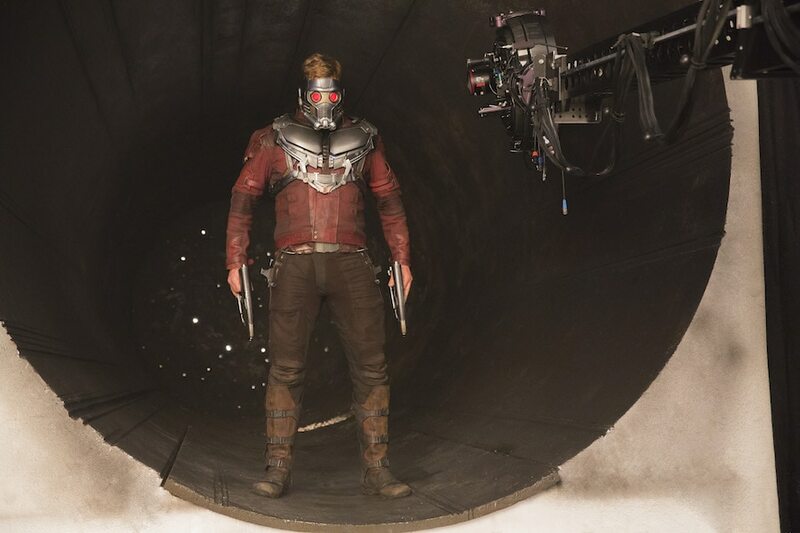 We are gonna loop back in with Yondu, the Michael Rooker character from movie one, who sort of raised Quill after taking him to space. We navigate that father relationship – it’s another big story thread for Guardians 2. After getting ripped off by the Guardians earlier in the movie, Yondu and, and his ravengers are looking for revenge. This leaves Yondu sort of on a collision course with the Guardians. But Yondu reconciles with his past sins and tries to redeem himself in this movie. What can you tell us about Mantis? There’s a new character in this movie called Mantis, who is a classic Guardian from the comics who is new in this movie and totally amazing. Mantis kind of works with, with the Kurt Russell character. And Mantis and Drax kind of have a really interesting relationship, which, which they tell you more about. It evolves over the course of the movie. Music was an important part of the first story. 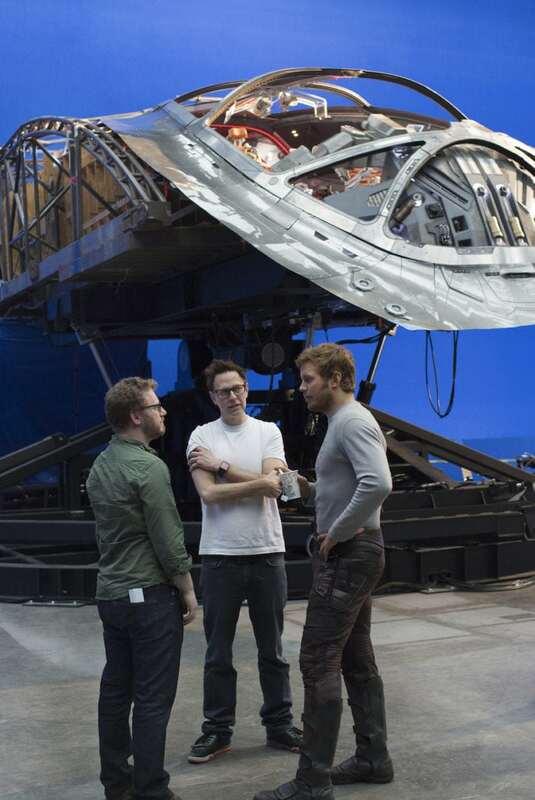 Will it continue to be so in Guardians of the Galaxy 2? Music plays a much bigger role directly in the plot than it did in movie one. 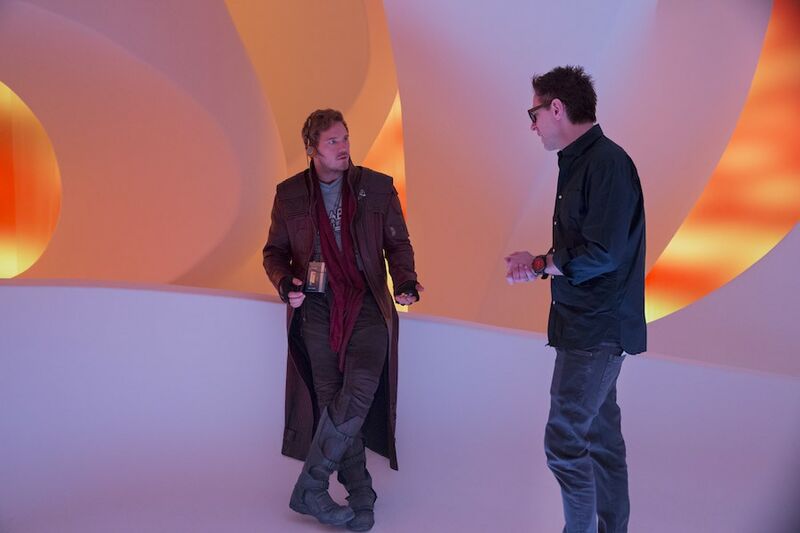 The story line with Quill’s father — did you know any of that, who he would be – before this movie came out? Or was that sort of conceptualized after it was in the theater? I think James started really thinking about it while we were shooting movie one. So, I think he kind of knew where we were going. So, so, yeah, there’s direction and a thread that you can follow for movie one definitely. So much fun!! 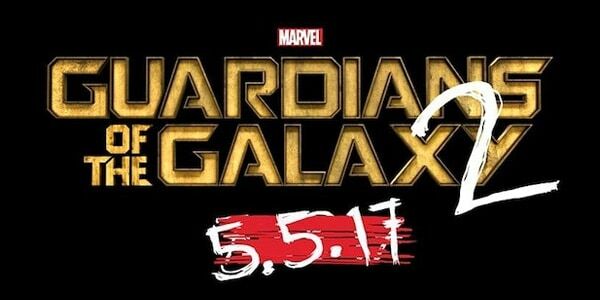 Are you planning on seeing Guardians of the Galaxy 2 when it hit theatres May 5th this year? I cannot WAIT! To wrap up, here’s another amazing clip that just aired yesterday during the Big Game!! * Disney / Marvel invited me to attend a press event for Guardians of the Galaxy 2 and covered my flights and accommodations. All opinions are my own.